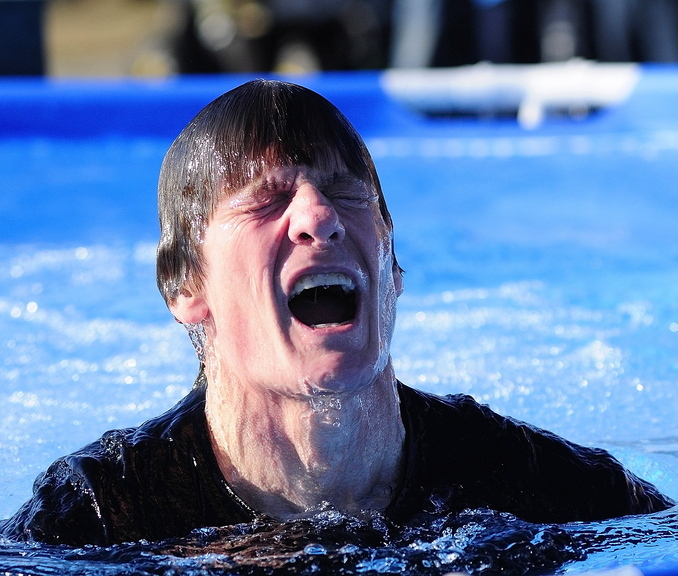 Polar Bear Plunge raises money for city park. AUGUSTA — Steam billowing from the soft-sided pool competed with smoke rising from an open fire just outside the wooden gates of Old Fort Western. Nearby, small ice floes rolled down the Kennebec River. It was the perfect day for a Polar Bear Plunge that would benefit summer swimmers and picnickers at Bicentennial Nature Park. 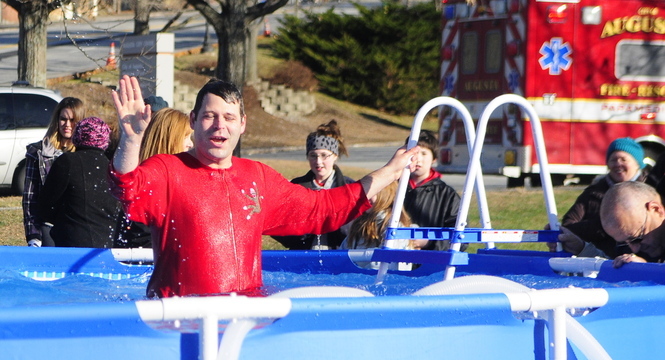 The polar dip was one of the more unusual events Saturday at the Riverfront Holiday Tree Lighting Tradition. The standard events took place as well, including the arrival of Santa Claus on an Augusta Fire Department ladder truck, horse-drawn wagon rides, entertainment, fireworks and crafts as well as a look back at earlier Christmas celebrations at Old Fort Western, accompanied by a booming cannon. The celebration was sponsored by the city and the Augusta Downtown Alliance. “I’m as Cold as Ice” blasted over the outdoor speakers as the swimmers gathered their courage. However, the chilly air meant only a half dozen people were brave enough to take a dip in the pool. Among them was Cheryl Clukey, one of the Friends of Bicentennial Nature Park, and the only female swimmer. She strapped a multi-colored float around her waist and donned snorkel, mask and flippers. Clukey urged the onlookers to support the cause. “This park is beautiful,” she said just before the James Bond theme song rang out as her cue. Clukey sat on the pool’s edge and hollered as she lowered her legs into the chilly water. She gave the crowd a brief blast from a water soaker toy before slipping into the pool and rapidly making her way to the other side. Another swimmer, City Councilor Daniel Emery, attired as an elf, said he had been swimming on the Fourth of July weekend, when the water termperature was 55 degrees. First into the pool was Brian Shea, a cardiologist who told the crowd he liked to give back to Rotary because he had been helped by a Rotary scholarship years ago. Then he leaped into the water to a thundering drumroll of music and sirens from the Augusta Fire and Rescue rig. This year, the city-owned Bicentennial Nature Park on Three-Cornered Pond opened after the Augusta Rotary and Augusta City Council each put in $20,000 to fund it. Tobias Parkhurst, downtown developer and skateboard pro, went in without music but with a perfect somersault. He wasted no time climbing out and hurrying off to change back into warm street clothes. Bob Dodge, who helped register swimmers and collect pledge money, said the Polar Bear Plunge, sponsored by Rotary, the Kiwanis Club and the Kennebec Leadership Institute, raised at least $500. The pool was filled with water that was a less-than-balmy 50 degrees when it came from a fire hydrant Saturday morning, said Jim Goulet, director of parks and recreation for the city. That made it at least 10 degrees warmer than the river, which had a coating of ice early in the day. Joselyn Ritchey, who works for the city’ Parks Department, strode around the scene in a polar bear costume with a white vest. However, she was not scheduled to swim.